Sunday morning we awoke, completely rested, (the Tahoe air-mattress worked out great!) to a warm, mist-like rain and the most amazing scent of piñon infusing the air. Santa Fe, NM is truly beautiful and it smells wonderful! The first thing I noticed upon awakening was that what I had taken in the dark the night before to be a small pond behind our parking spot was actually just a grassy bit that had been flooded with rain. Drainage had occured in the night, leaving just grass behind. The problem with this was that I had thrown a bit of tissue in the “pond” in the middle of the night… assuming that it would sink and decompose forthwith. 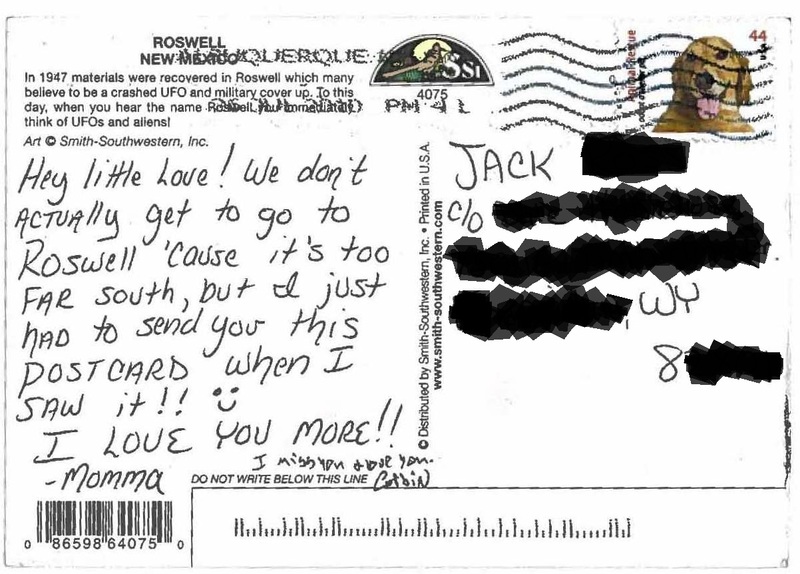 Not so much, though. It just sat there on the grass, repudiating my night-time justifications of biodegradable material sinking to the bottom of a murky parking lot pond… Woops. 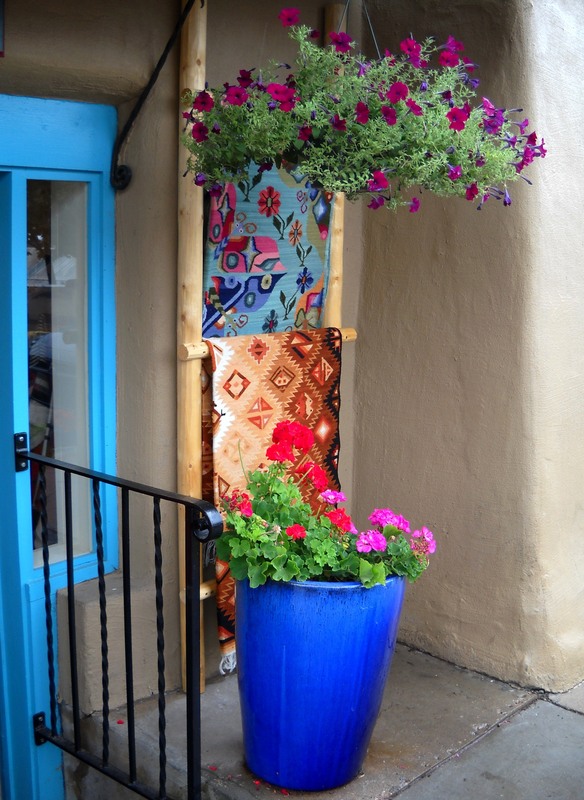 We drove back to the Santa Fe Plaza area, purchased lattes at the Father Sky, Mother Earth Gallery & Espresso, and took a stroll with our coffee in the morning light. 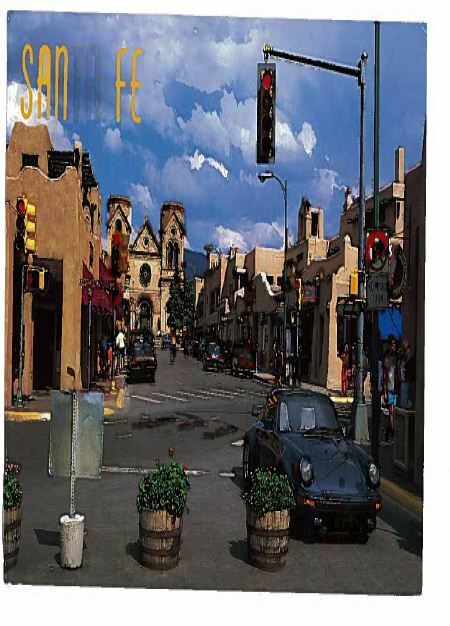 This city-square, in true Pueblo style with traditional adobe architecture, is known as the “Heart of Santa Fe” and is a National Historic Landmark that dates back to the early 1700’s when Santa Fe was settled by the conquistadors. The Plaza is full of historic monuments, restaurants, businesses and art galleries, including The Palace of the Governors (the oldest public building in America), the Cathedral Basilica of Saint Francis of Assisi, and the Loretto Chapel. 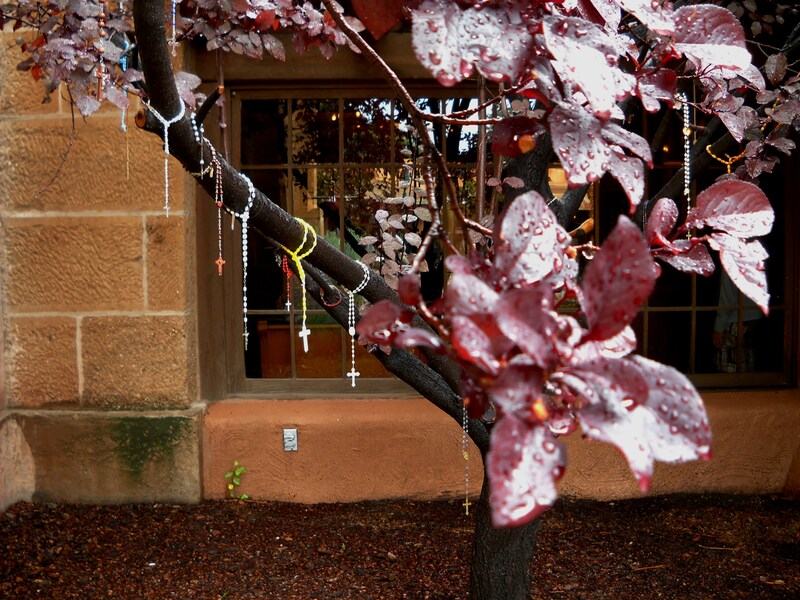 Rosaries hanging on the tree outside the Loretto Chapel. Photo by author. 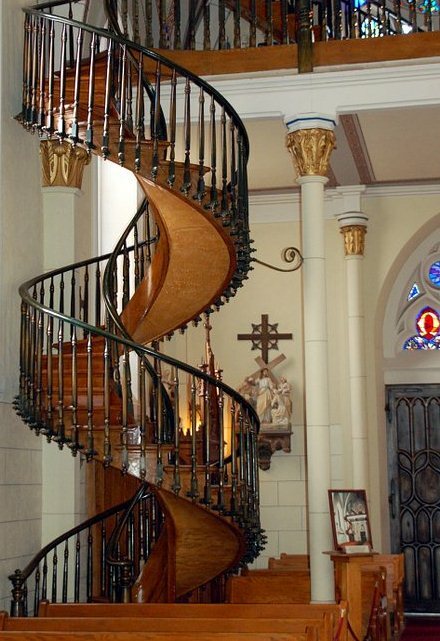 The Loretto Chapel, home of the’ miraculous staircase’, has an interesting story. In 1878, the Sisters of Loretto had a beautiful chapel and no way to access the top level. 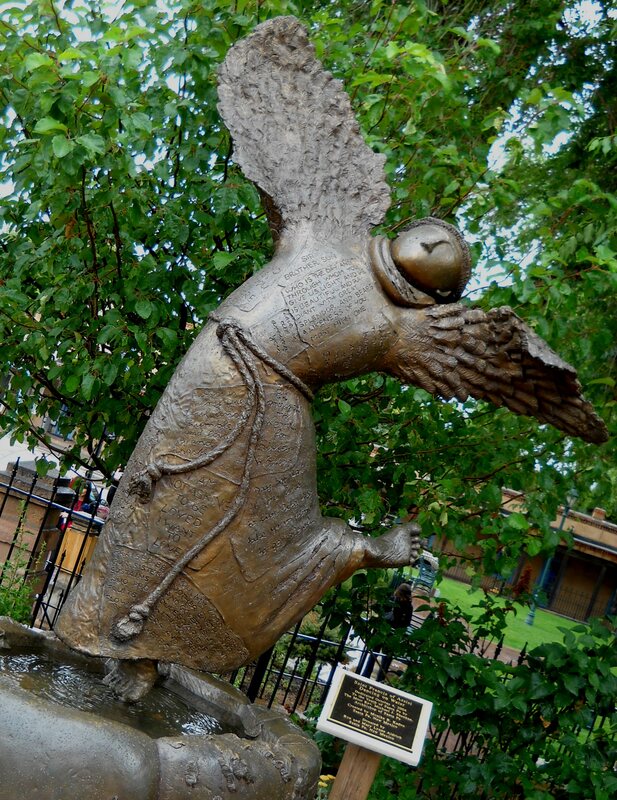 St. Francis of Assisi, patron Saint of animals & environment. Photo by author. “Needing a way to get up to the choir loft the nuns prayed for St. Joseph’s intercession for nine straight days. On the day after their novena ended a shabby looking stranger appeared at their door. He told the nuns he would build them a staircase but that he needed total privacy and locked himself in the chapel for three months. He used a small number of primitive tools including a square, a saw and some warm water and constructed a spiral staircase entirely of non-native wood. The identity of the carpenter is not known for as soon as the staircase was finally finished he was gone without ever asking for any payment. Many witnesses, upon seeing the staircase, feel it was a miraculous occurrence. This story may be more legend than anything; some engineers argue that the helix shape of the staircase is unsafe rather than miraculous, and there are theories about the wood, the construction, etc.. What we found interesting though, is that although the mysterious carpenter reportedly did his good work for free, it now costs $3.00 to see the miracle. 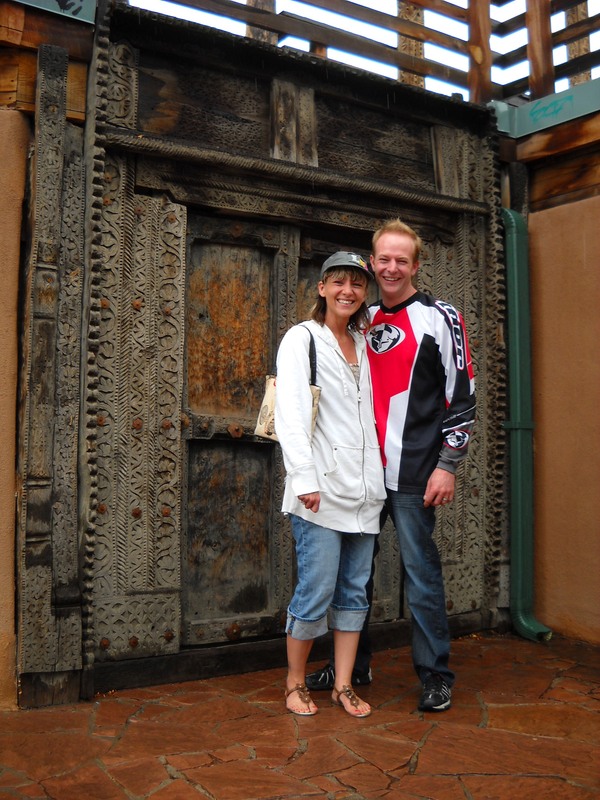 Santa Fe Plaza was a beautiful sensory experience, and a thoroughly enjoyable morning for us. 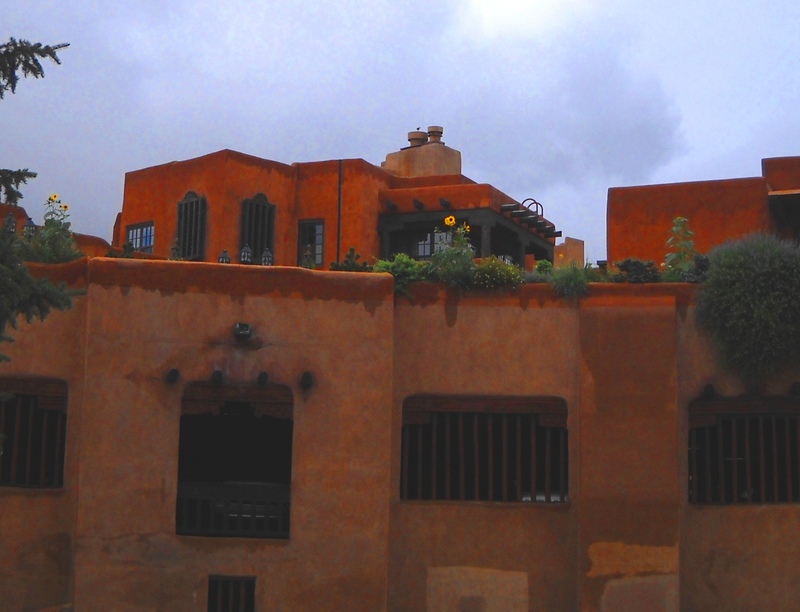 Santa Fe is painted in bright, primary Southwest colors. Photo by author. Adobe Plaza. Photo by author. 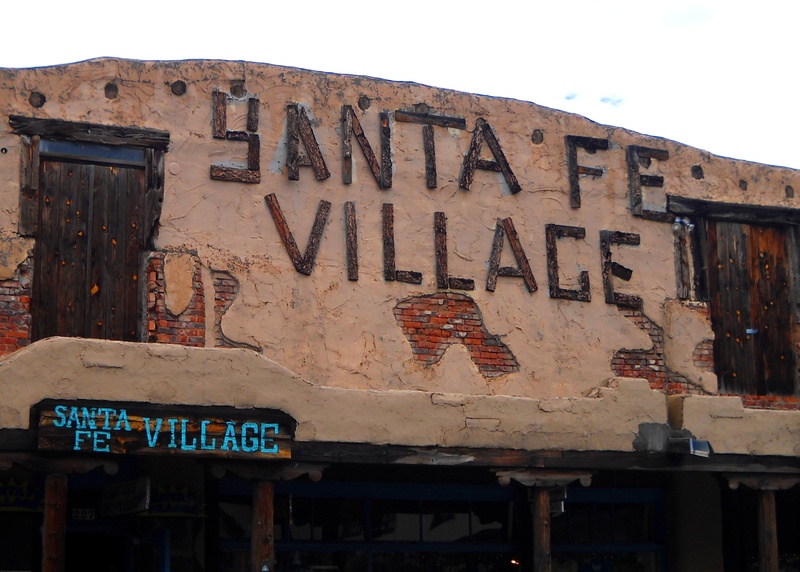 Santa Fe Village. Photo by author. 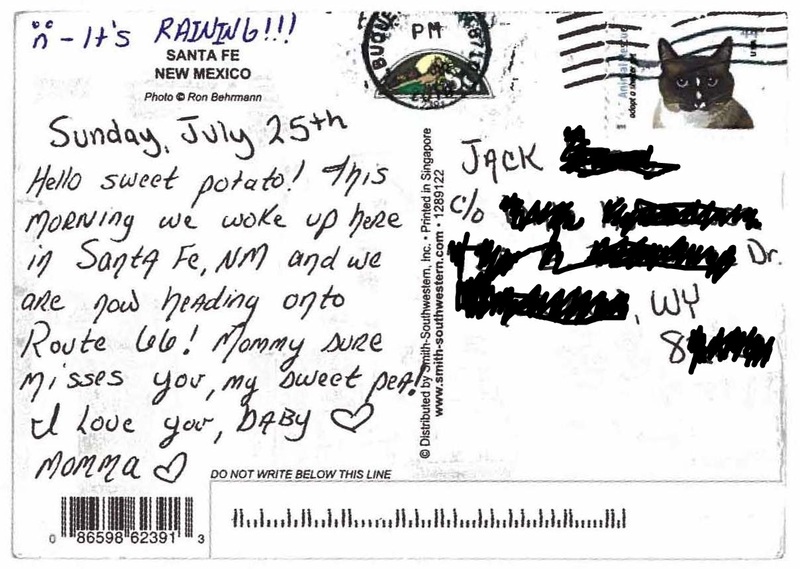 We couldn’t linger long, though, for it was Day Two of The Ultimate Summer Road Trip, and our wheels needed to be on Historic Route 66, so after mailing postcards home to the kids we hit the road to experience New Mexico along the Route! We had a choice of taking the pre-1937 alignment over La Bajada Hill, or backtracking a bit and taking the post-1937 Route 66 alignment to Santa Rosa. My husband wanted to see the Route 66 Auto Museum and I longed to see the Blue Hole, so on to Santa Rosa it was. While passing Las Vegas, NM (a tiny, historic burg with the narrowest cobblestones streets imaginable) we decided to detour through and try to find the Montezuma Hot Springs: a collection of hot springs bubbling out of the side of a hill, feeding a variety of rustic rock and cement tubs. These springs (and bathhouses) were originally used by the historic Montezuma Castle Resort and though most of the bathhouses are gone, I’d read that the springs (out in the open) were still available to the public and that they’d been kept rather clean by the property owners, the United World College. Also, there were fissures and holes in the pool that we carefully avoided, as a cautious foot down one such hole didn’t reveal a reachable bottom. 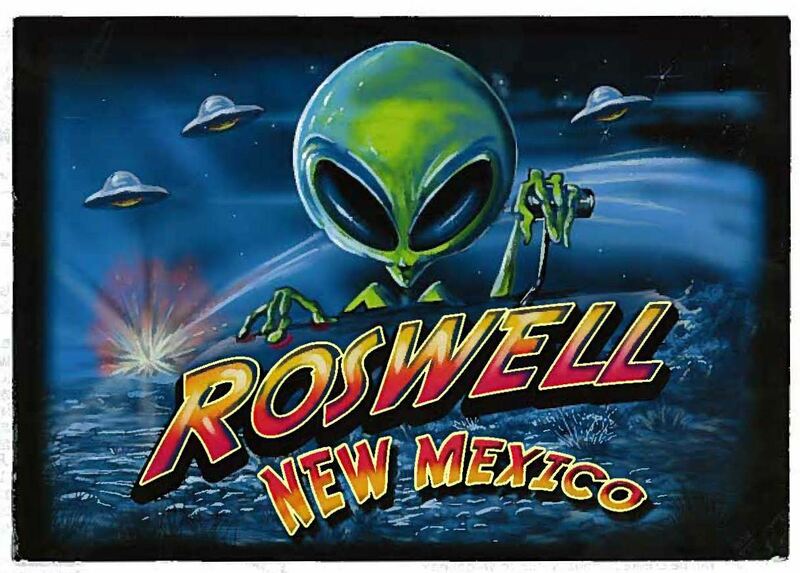 Then it was time to head southeast; our destination ~Santa Rosa, New Mexico!